Jarrod and I celebrated our 10th Anniversary on June 15th! Yay us! We spent 3 weeks passing around the stomach virus. Yuck. My parents came to visit for a week. Jarrod and I jetted off to Niagara Falls, Canada for our 10 year getaway. So there's the scoop! Over the next few days I will get caught up on pictures and postings of the happenings and give you all a baby review. BEYOND thrilled for you! Babies are complete miracles and I'm happy you've been blessed again! When are you expecting to see this little one's sweet face? I tried to comment yesterday, but my phone wouldn't let me, so I texted. Still had to get on here and say CONGRATS! Stinks that y'all passed around the stomach bug. Yucky!! Congratulations on your big 10 year anniversary!! P.S. Congratulations also on Baby #4!!! So happy for you guys. I know what you mean about getting no rest. I'm exhausted every night. Thank goodness only two months left to go! 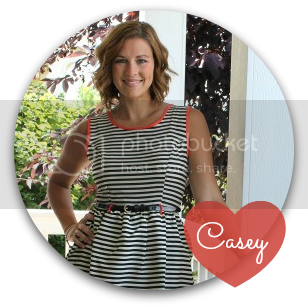 Congratulations, Casey!! Wow! Yay! It literally took my breath away. :) Congrats agains! !